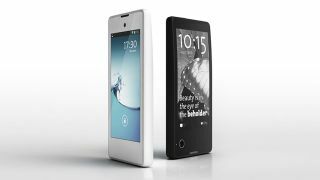 Remember the Yotaphone? You do, it was the one with a screen on the front and a screen on the back. While the first generation's LCD display was a touchscreen affair, the power-saving electronic paper display on the other side wasn't, merely giving you an at-a-glance hub of notifications, the time and calendar reminders. But the new Yotaphone 2's electronic paper screen is a full touch one, so you can open and respond to notifications using the low-energy screen rather than the more battery-hungry one on the other side. The 4.7-inch EPD also rocks higher resolution and greater pixel density than its predecessor and comes with a built-in light for reading in the dark. This is one time where the internet really fails to capture the true excitement of a phone throwing multiple screens at a problem. The idea is that the always-on electronic paper display (EPD) uses less power than you firing up the AMOLED screen on the other side to check for messages. Using just the EPD, you're looking at upwards of 50 hours' battery life from a full charge. Other adjustments to the device include upgrading the LCD screen to an AMOLED display. The colour screen is also bigger (5-inches), and the handset is powered by a quad-core 800 series Qualcomm processor. Other features include wireless charging and NFC. If all this sounds good to you, then we're sorry to report you'll have to wait until Q4 2014 (October - December) to get hold of the new Yotaphone in Europe or Russia - the US and Asia will have a further three-to-four month wait on their hands. But if you've already invested in a first-gen YotaPhone, you'll get a "significant discount" on the new device.